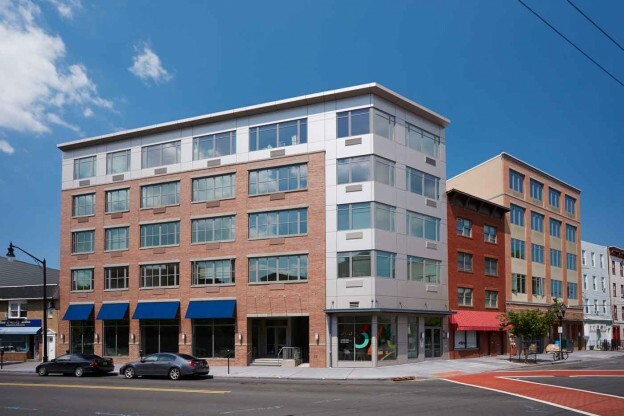 This mixed-use apartment building occupies a visible corner in Jersey City and wraps around an existing building adding complexity to an urban infill project. The building incorporates (2) distinct architecture styles to break down the scale of the project and sit better in the existing neighborhood. The ground floor is animated with a modern restaurant with tons of glass providing an informal place for residents to meet and eat. The use of high quality materials including metal panels and brick veneer blend seamlessly with the expansive windows providing a bright and open feel to the smaller apartments. This entry was posted in Mixed Use, Sustainable Design on October 20, 2014 by Debbi Miller.